The new owner of Fat Jimmy's Outfitters needed a complete rebrand to position the company as "outfitters for human powered recreation." 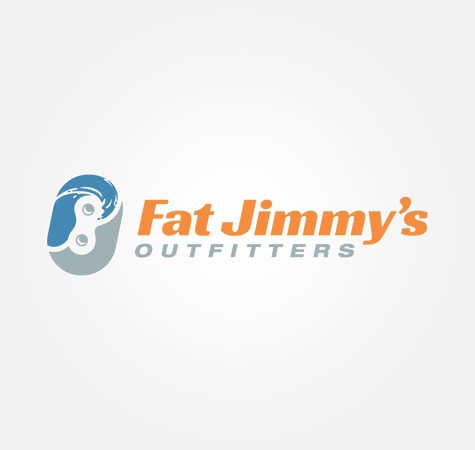 We developed a new logo that neatly symbolizes Fat Jimmy’s Outfitters, a sporting goods store in Bedford, and strengthens its image as an active part of the cycling and water sports communities. The modern, clean mark consists of an abstract, interlocking F and J. The blue F has marks that suggest a wave, representing the water sporting department. The negative space within the mark forms a chain link, representing the cycling department. The new website we developed for Fat Jimmy’s Outfitters includes a mobile version of the site so that it looks good on smartphones and tablets. The site includes a Instagram feed, allowing Fat Jimmy’s owners to upload a steady stream of new product and outdoor images. Additional custom features include product spotlights, continually-updated weather conditions in the areas the store serves, and a news and events section. The content management system makes the site easy to update. This elegant icon system was developed for use on Fat Jimmy’s website and other collateral. Symbols for the different Fat Jimmy’s departments — including cycling, water sports, and the cycling service department — are included, as well as symbols for other features of the site, such as weather.